Governor Andrew M. Cuomo today announced the dedication of the Commercial Street Bridge at Canalside as the “Roswell Park Cancer Institute Bridge of Hope.” As part of the dedication, patients from Roswell Park Cancer Institute gathered at the bridge to celebrate surviving cancer with a ceremonial hanging of ornamental bells on the bridge. The ceremony was hosted jointly by Roswell Park and Canalside. A photo of one of the ornamental bells is available here. There is a widespread tradition at cancer centers throughout the country that when a cancer patient finishes treatment, he or she celebrates by ringing a bell. From this iconic location in the City of Buffalo, the Bridge of Hope at Canalside gives cancer survivors the opportunity to hang a bell to honor their survivorship. Diagnosed with advanced breast cancer in 2009, Averl Anderson has embraced cancer survivorship by becoming a passionate advocate for breast cancer prevention and for participation in clinical studies. Today, she offered her thoughts on survivorship. Roswell Park, in recognition of the unique medical needs of cancer survivors, will open a Survivorship Center within the newly constructed Roswell Park Clinical Sciences Center this spring. Upon completion of active treatment, patients will be seen in specialized clinics for their cancer-related care and follow-up, including mammograms, colonoscopies, nutritional guidance, pain management and other services. The Bridge of Hope will be in place at Canalside for the next three years. 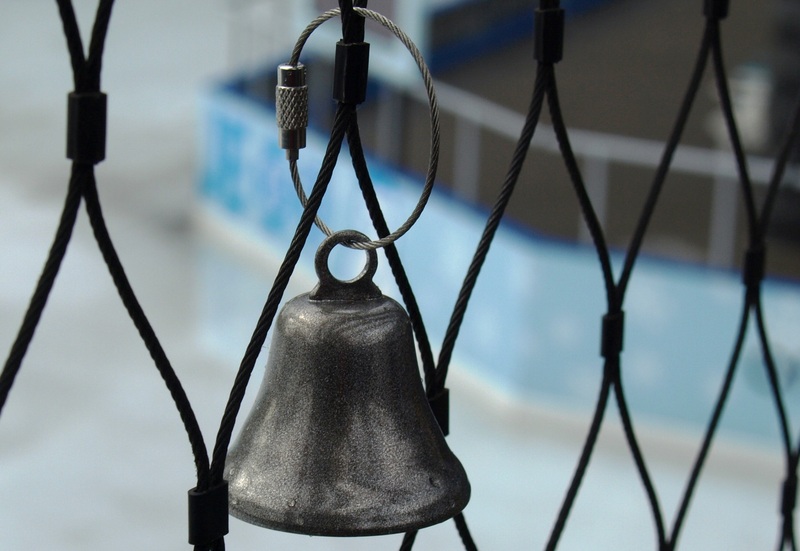 Phillips Lytle LLP is the generous sponsor of the silver-colored bells that will be given to Roswell Park patients upon completion of active treatment. Bells also can be purchased at participating retailers, including the Gift Shop at Roswell Park, ANNARLETTE Contemporary Women’s Fashion Boutique, 3959 Main St., Buffalo, NY 14226 and both Modern Nostalgia locations — at HarborCenter and on Hertel Avenue. Beverages for the Bridge of Hope event were donated by Dunkin’ Donuts. The Bridge of Hope sits on Commercial Street near the intersection of Pearl Street and Perry Boulevard.